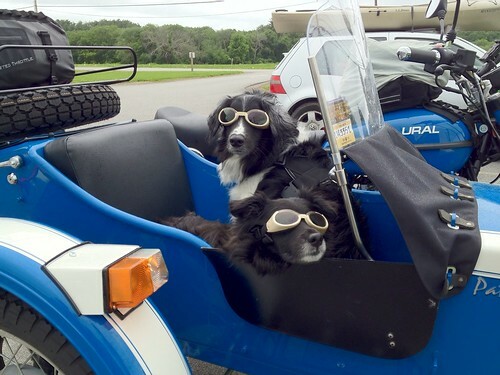 I finally combined Doggles and the Ural to create the ultimate canine acclimation experience. 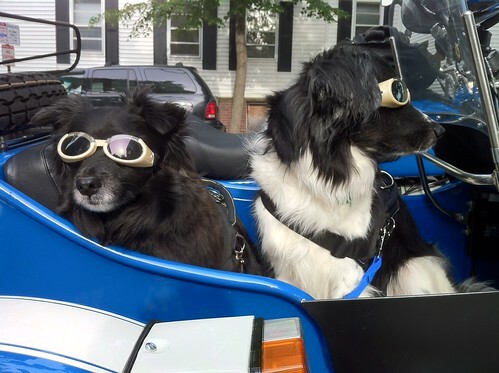 It turns out, the dogs are much less resistant to wearing Doggles on the Ural. They’re much more inclined to keep them on – especially when we’re moving. But if we sit still for too long at stoplights, Bandido in particular is inclined to rub his face against anything handy to try to get the Doggles off. He’ll rub against the grab bar on the windscreen, against the side of the sidecar tub, or against a handy human knee whilst attempting to get the Doggles off his face. He mostly only manages to lift the Doggles up above his eyes, where they eventually slide down again. I suppose we should tighten the chin straps. Remember how we said we wanted to leave enough room for the dogs to move around, but prevent them from jumping out entirely? Yeah. As it turns out, we were a bit generous with the leash space. Ben proved that he could jump out of the sidecar once we had come to a stop at home at the end of one of our trips. Instead of waiting for me to come around and unstrap him, he just jumped out of the sidecar to head inside. He was able to get himself around next to the sidecar wheel, and I was just grateful we were stopped at home. I told Kay at that point that we really had to adjust the leashes, and that I wasn’t comfortable with that degree of slack, but he wasn’t interested in making any changes because he wanted the dogs to have enough slack to be comfortable. Well, that sorta backfired on us. Last Friday, I took the dogs out to Sheepfold reservation, where they have a nice 10-acre field for dogs to run around off-leash. It was the first time the dogs were in the rig at a decent speed – I got up to about 45MPH at one point – and as it turns out, both dogs LOVED it. 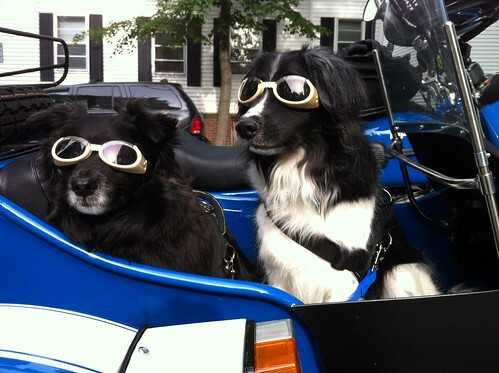 Unfortunately, Ben loved it so much that he stood up in the sidecar with his front paws on the sidecar fender. All it would have taken was one little bump, or a left curve in the road, to boot him right out of the sidecar at 45MPH. With the amount of slack on his leash, I was NOT happy, so I grabbed the handy grab handle on his harness and pulled him back inside the sidecar. Thankfully, he stayed put. Then, to top off my heart-attack-waiting-to-happen, I had a couple of steep hills to go up to get into a parking lot at Sheepfold. And I noticed as I was attempting to get up the second steep hill up a right-hander that Bandido had hopped out of the sidecar and was now being held by his restraint against the sidecar wheel. YIKES! I immediately braked, panicked about how to keep the bike from rolling while I got off and went around to grab him, and then remembered that the bike has an emergency/parking brake. So I set the brake (on a rather steep incline – I was glad the brakes were effective) got off the bike and ran around to grab him. No harm done, but there was NO WAY I was riding back with the dogs having that much slack. First, Ben almost took a dive out of the sidecar at 45MPH, and then Bandido DID take a hop out of the sidecar – thankfully I was practically stopped but it was nerve wracking to say the least. After the dogs had a nice little romp, I made them wait in the parking lot while I tied new knots in the leashes to shorten them. The dogs didn’t have a lot of leeway, but I felt their safety was paramount and I was a bit gun-shy after having two near disasters with the dogs in the sidecar. Thankfully, on the way home, they were much calmer (as they’d already run around) so things went pretty smoothly. We’re now working on tweaking the harness and restraint system to make things more secure while still giving the guys enough space to be comfortable. Our Ural is really pretty. The paint scheme is nice, and on its own it gets a lot of attention. People tend to smile when they see it, and sometimes wave or give us a thumbs-up. Add in dogs wearing Doggles, and you get a LOT of UDF. 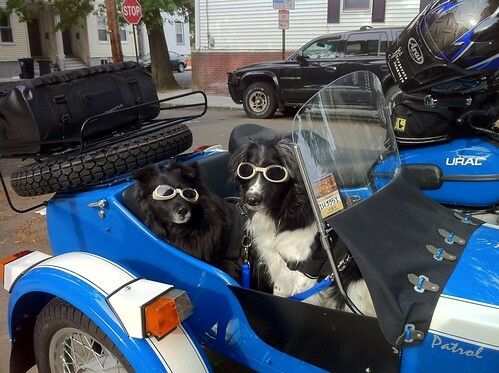 There are now dozens of pictures of our guys wearing Doggles and riding in the sidecar floating around Boston. I’ve been getting a lot of: “That is AWESOME!” People come from all angles to try to get pictures and videos of the guys. It’s kinda fun to brighten so many peoples’ days, and of course the dogs are having fun, so we’re all enjoying it. Ben is a bit… protective of our property. He’s extremely barkey in our home whenever the mailman, delivery man or even our friends come around. He’s also quite barkey in cars – I can’t safely go through a drive through without him wanting to bite anyone sticking their arm inside the vehicle, and toll booths are… interesting. It is with mixed emotion that I report that Ben has taken to guarding the Ural just as noisily. On the one hand – we have a very effective Ural Security System. I don’t really have to worry about anyone stealing stuff from our soft (unlocked) bags on the bike. On the other hand, anyone who approaches or even tries to take a picture from a passing car gets a vicious-sounding bark, and a lunge if they get too close. I think it’s only a matter of time until this guarding goes horribly awry, so I guess it’s time to call in a dog trainer to work on that. But I do kinda like having a Ural Security System. Ahh, well. Anyway. We’re scheduled to go this weekend up to New Hampshire for a camping trip. It’s around 120 miles, which will by far be the longest trip we’ve taken with the dogs. I’m hoping to get them out for some rides between now and Friday, but the weather isn’t particularly cooperative, so I may just have to wing it and hope they do well. But Bandido, at least, will be raring to go.